5793 labyrinths found. Showing 5101-5120. Sorted by country, state, city, then zip/postal code. World Labyrinth Day, May 7, 2011: 1:00 p.m. Walk for World Peace. Located on Main Fort Bliss, across from the 24 hour shopette in the WTB complex. From I-10, take Artcraft Exit; right on Westside Dr; after 2 miles, left on Gato Rd; 810 is the first house on left. I-10 West from San Antonio - exit Ralph Fair Rd. Go approximately 3 miles to Pimlico - turn left. Preakness is first street on right. 28643 is 3rd house on left. Located on church property, everyone is welcome. Take the entrance to the church off Old Fredericksburg Road and the labyrinth will be straight ahead located behind the wooden benches and bulletin board. Made entirely from local stone, this labyrinth seems to be a part of the nature around it. On the property of John Knox Ranch, a Presbyterian camp and retreat center. The Sunset View Labyrinth, located in the front yard of a private home above Canyon Lake in Eagles' Peak Ranch subdivision. 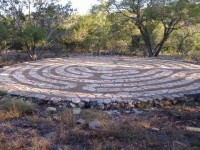 Sunset View Labyrinth is in Betsy and Russ Lambert's front yard overlooking Canyon Lake. Their property backs up to Texas Hwy. 32 on the western beginning of The Backbone but the front of the property faces southwest towards Canyon Lake. Take Hwy. 32 to Eagles' Peak Ranch Road and go one block to Sunset View. The labyrinth is on the left and visible from the road at 1140 Sunset View. It is a classical seven-path circular labyrinth, left-opening and formed of native limestone rocks around a large fire-pit. "Circling," an interactive sculpture located at the south side of Terminal D, this work consists of a labyrinthine pattern on the floor in colored terrazzo and curved glass walls interspersed with bursts of sound along the paths. Located inside security area, so can only be accessed by travellers. Check website for scheduled walks. St. Stephen is located in the TCU area of Fort Worth. There is also a portable indoor canvas labyrinth that is available on request. The unique St. Stephen labyrinth and prayer garden were designed to fit the space directly east of the sanctuary and to be consistent with the existing architecture. Bryan Bogard of Jose Serna Concrete Co.
32 42' 49.13"° Lat. ; 97 21' 18.30"° Long. Small labyrinth on church grounds. Oak tree in the center, filled with wind chimes. Part of our "Welcome Garden." 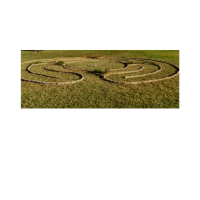 The Labyrinth is a short distance from the rear parking lot of the church, in an open field. Originally made of pebbles arranged in a pattern in 2009. The pebbles were replaced by bricks in 2011. In both forms the labyrinth was built by the youth members of the church. Turn in the Agape MCC church parking lot and go to back of paved parking area (behind church buildings). Labyrinth is on the right or northeast side of property. Enter by bridge and enjoy our classical style labyrinth. You are welcomed! Two blocks south of highway 820 on Trail Lake Drive.